Dimensions: 6" x 8 1/8"
A window in the Susan Lawrence Dana House in Springfield, Illinois, featured Mr. Wright's repeated design of the native prairie Sumac plant, in an abstract form. An autumnal feeling is created by the use of rich amber and green colors in the glass. The original window was one of a pair located in the reception hall of the house. 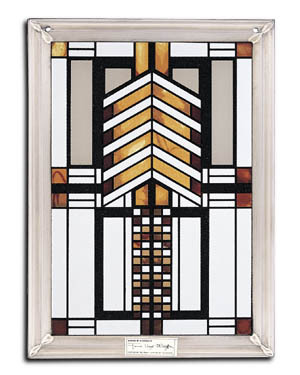 This stained glass panel has been developed in association with the Frank Lloyd Wright Foundation. It comes with a metal plaque indicating certification by the Foundation and includes Mr. Wright's signature.